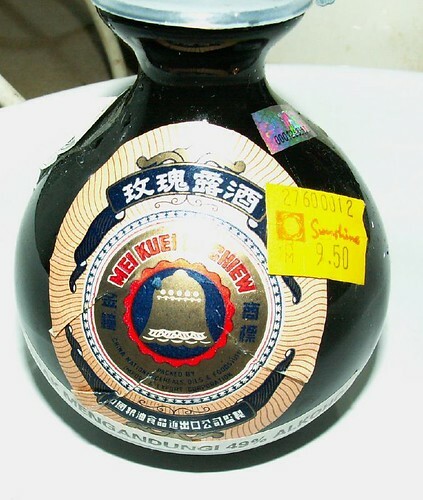 I tried to fine out more information about this mei kwei lu Chinese wine but can’t dig out much.Â It is a very fragrant wine which is suitable for meats and is an important flavourings for making bak kua or barbeque pork. My sister-in-law used this mei kwei lu to season the mince pork and the meat turned reddish.Â Hmmm…I don’t know how that happens because the wine is colourless.Â However, Mei Kwei means rose (the flower) and I suppose this is made from rose flowers. Note that this is a very potent brew indeed.Â There is 49% alcohol in it so I bet it will knock the drinker off after a few sips.Â I didn’t try to taste the wine so I can’t tell what it tastes like.Â So far, I only use it in seasoning pig trotters. I would appreciate some cooking ideas for this Mei Kwei Lu so that the wine doesn’t evaporate before I manage to finish using it in my cooking.Â I read that this is Yang Kwei Fei’s favourite wine?Â Yang Kwei Fei was the legendary beautiful concubine of the Chinese emperor. I always used this fragant wine to season my homemade char siew. Mix a few tablespoon of this wine together with finely chopped garlic( a whole pip) + thin and thick soya sauce + brown sugar or honey to your Sam Chan Bak. Keep ( better overnight) in the fridge. Then grill it in the oven or over gas stove in a heavy base pan covered. Try it. I think your children will love it. Mine always fight over this dish ha..ha. Thank you for your blog sharing so much about food especially those from Penang. I wished to know where I can buy this Mei Kuei Lu wine in Penang. I am from KL and is interested to buy a few bottles for my cooking. ari – You can get it from either Chinese medicine shops who sell liqour or shops selling liquor and include Chinese wine. I bought it from Sunshine Farlim liqour section. molly – I had been meaning to make bak kwa with them but never got around to test it yet. Agnes – Oh wow, can drink? 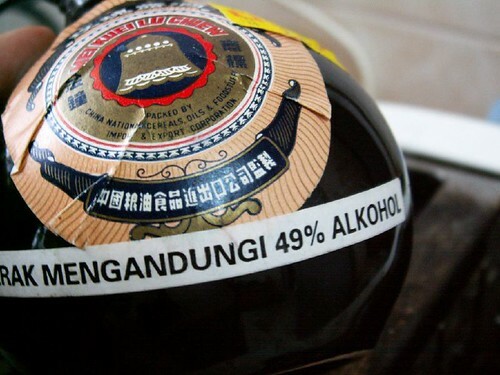 I won’t dare to try ‘cos the alchohol content so high, later I mabuk. Hahaha. Earl – I bet it is very potent. Mei Kwai Lu is a very fragrant spirit, and yes, it is quite strong. Depending on the brand, it goes from harsh to mild on the palate, with a pleasant sweet, rose aftertatse. In other words, it goes down like gasoline, but you burp up roses!